SpeedNews' 5th Annual Aerospace Manufacturing Conference was held on May 2-3, 2017 in Dearborn, Michigan. This Conference brought together the leaders of major manufacturers and suppliers in the aerospace industry to discuss manufacturing operations, capabilities and processes, innovation within manufacturing, modern machining technologies, automation, and industry trends. The Conference themes are very much operational in nature and our speakers and panelists have tremendous hands-on manufacturing experience. The focus of the Conference was on all key manufacturing aspects including: tooling, machining, components, electronics, advanced materials engineering, and technological systems. In addition it will cover what is really behind the hype of Internet of Things (IoT), Additive Manufacturing (AM) and Big Data and how the Auto and Aero industries learn from each other. Delegates were updated with real examples of products and knowledge that helped and inspired them to improve the productivity and profitability for their own operations. 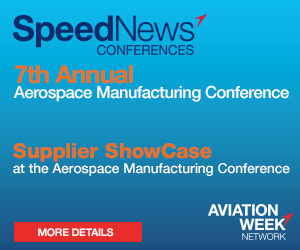 The SpeedNews Aerospace Manufacturing Conference provides company presidents, vice presidents, directors, C-level executives, general managers, procurement, production, sales and marketing, R&D, engineers, investment, and quality control professionals, the opportunity to network and gain a full understanding of the aerospace manufacturing industry. Delegates had the opportunity to visit RCO Engineering and Linear AMS. Following this event, the first AeroAuto Conference, on May 4, united executives representing aerospace and automotive manufacturers and suppliers to explore the many synergies between the massive global aerospace and automotive manufacturing industries.